We have finished things! And discuss different cultural tastes. There is one swear word and talk about hyena anatomy. Children, beware. 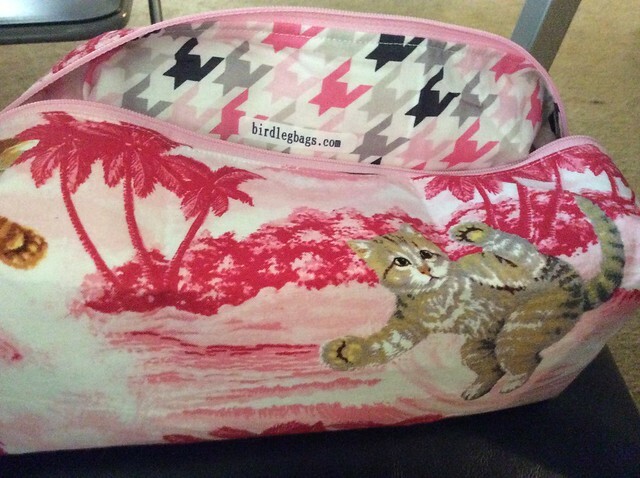 Jill bought a surfing cat project bag from BirdLegBags. Michele bought a bunch of acrylic from Jo-Ann's including Red Heart with Love and Vanna's Choice Tapestry. Jill has finished her Hitofude Cardigan! Her Rav page here. She also started and finished her Aurelia Cowl by Hilary Smith Callis out of Noro Silk Garden Sock yarn. She needs to have modeled Fall pictures taken of the cowl. She has been continuing on her Sophie's Universe CAL blanket and still spinning the Red Fish Dye Works Merino/Silk roving. Michele has woven in the ends on her Mielie Vest. She also started and finished the Hadley Button Slouch Hat by Justine Walley in Red Heart Fiesta. She is working on her Clincher again too. Michele has been buying up all of Justine Walley's hat patterns. Her etsy shop is here. Jill is going to start the Kitefish Shawlette by Leah Coccari-Swift in Madtosh Sock in Cosmic Wander Dust if she can decide on a contrast color. The Craft-a-long will be starting August 1 in our Ravelry Group! Jill is thinking about making either the Sleeveless Tuxedo Shirt by Theresa Schabes or the #11 Flowered Belt Camisole by Mari Lynn Patrick. Or maybe the Beatnik by Norah Gaughan. Michele is thinking about the Stripey Spring Cardigan also by Mari Lynn Patrick, which is a crochet cardigan. Or maybe she'd use some yarn from Unwind Yarn Company for a shawl. Michele is so excited about the new Harper Lee book, Go Set a Watchman. There is also a new Judy Blume book, In the Unlikely Event. And coloring books for adults! Such as, the Secret Garden book. Jill started reading The Martian by Andy Weir. She is listening to Some We Love, Some We Hate, Some We Eat by Hal Herzog.